A harvester is used to deposit paddy crop in a tractor trolley on a field in the outskirts Ahmedabad. Photo by Reuters. Mumbai: Cotton farmer Ravindra Krishna Patil in India’s Maharashtra state should be feeling flush after strong monsoon rains and a good crop, but high costs have cast a pall over his preparations for the festive season. Instead of splashing out on gold jewellery, appliances or maybe even a car during the biggest shopping season of the year, 28-year-old Patil must count his rupees after costs of everything from fuel to labour soared while cotton prices have fallen by nearly half. Producers of other major summer-sown crops such as rice, sugarcane, soya bean and maize also have to contend with falling prices and rising costs, which may ultimately contribute to crimping the growth of Asia’s third-largest economy. “Like last year, I was planning to buy some gold for my family members during Diwali. But now it is not possible. Cotton prices have dropped and gold has rallied," Patil said. “I have spent more money than last year. The cost of seeds, fertilisers rose. Labour wages jumped, but my profit fell," he said, adding that he spent about Rs400,000 ($8,107) for cultivating 16 acres of cotton, compared to Rs290,000 a year ago. Rising rural incomes have been a key driver of India’s broader economic growth as well as revenues for makers of consumer products, such as Hindustan Unilever and Godrej Consumer, and motorbikes including Hero MotoCorp Ltd and Bajaj Auto Ltd.
Usually, a good monsoon and strong crop yields raise rural spending. Weaker rural demand may exacerbate slowing growth, although it could also cool inflation, which remains near double digits despite 12 interest rate increases since March 2010. About 600 million Indians make a living from farming, even though agriculture makes up only 14.6% of the economy, down from 30% a decade ago. The sector is infamous for the large number of suicides committed by farmers, whose livelihood depends almost exclusively on the whims of the weather. 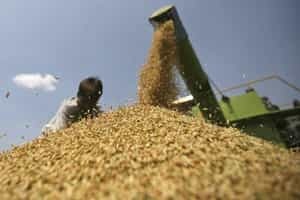 India, the world’s second most populous country, aims to produce record food grains of 245 million tonnes in the current crop year to June, an increase of 1.4% thanks to good monsoon rains. Record output, however, is pushing down prices, and government minimum support prices have not risen in line with higher input costs. Soybean futures prices have dropped 19% from this year’s peak, while corn and rubber have dropped 27% and 13% respectively, from year highs. Turmeric and cotton prices are at half their peak levels. Maharashtra produces the largest cotton crop after top producer Gujarat. After months of delay, India in June raised the state-set price of diesel by 9%, lifting the cost of ploughing, tilling and other land preparation operations for farmers. A jump in fertiliser prices in the world market and a government move to ease its subsidy burden forced fertiliser makers to pass rising production costs to farmers. What has hurt profitability most, farmers said, is rising wages for labourers, driven by government efforts to ensure a minimum level of paid work for rural households under its National Rural Employment Guarantee Act (NREGA). “Farm labourers’ wages have gone up sharply. And even after paying higher wages there is no guarantee you will get workers," said George Valy, president of the Indian Rubber Dealers’ Federation. “The biggest task for farmers is to find workers." Daily wages for female farm workers in the Jalgaon area, where Patil farms cotton, have risen to Rs100 this year from Rs75 a year ago and for male farm workers to Rs200 from Rs150. Overall, farm wages in the area have more than doubled over four years. The NREGA’s impact on labour markets and broader inflation prompted India’s farm ministry to ask the rural development ministry to halt the scheme during the sowing season. “For farmers, labour cost is a dominant factor in production expenses and labour wages are going up. Labourers are demanding higher wages as they are also feeling pinch of higher food and fuel inflation," said Ashwini Bansod, a senior analyst at MF Global Commodities India. Rising production costs have prompted farmers to resist selling their produce at lower prices whenever possible. Sugar cane farmers in Maharashtra and Uttar Pradesh states, which account for over 60% of India’s total output, have demanded prices above the federal government-set level. The dispute over prices has delayed the start of the crushing season. In parts of the southern state of Andhra Pradesh, rice farmers protesting higher production costs and lower returns refused to plant. The federal government is now considering raising the purchasing price for rice. “Production cost has been rising much faster than farm gate prices. You may see a rise in prices of farm commodities, but profit is not rising. It is shrinking," said Raju Shetty, a farmers’ leader and member of parliament. “Production cost of each and every crop has gone up. This year we have seen a rise in fertiliser, diesel and electricity prices. This needs to be compensated by higher prices." Some farmers who in better years would be splashing out on everything from electronics and gold to cars and clothes ahead of Diwali are saving more for winter-sown crops, which will demand higher investment than last year. “I can’t do Diwali shopping like last year," said Jaydeep Koruchi, after harvesting his soybean crop in the Sangli district of Maharashtra. “Soybean prices have fallen. So whatever little profit I will get from the crop I need to spend it on sugar cane that I am planning to cultivate," Koruchi said.